In collaboration with the Council of Graduate Schools, ETS convened academics, university administrators and other higher education leaders alike to dive into difficult topics on race and identity of all forms as well as to discuss proven, research-based and data-driven strategies for how to both increase and retain under-represented minorities (URMs) in graduate programs across the country. From the plethora of ideas and suggestions shared by the event’s speakers, three key themes resonated with attendees and offer an opportunity for further exploration and continued conversation. DeRay Mckesson, an activist and former school administrator, introduced this point in his keynote remarks, which focused broadly on the concepts behind equity and access in the context of higher education. If we as a society, or even at the institutional level, applied the same rigor and determination to searching for diverse talent and students that we do in searching for cures for diseases like cancer, results would change. Such a shift would require immense amounts of effort and intentionality, but so does finding a cure, and we don’t shy away from that. Moreover, the inherent difficulties of uncovering and identifying talented and diverse students was summed up well by Marenda Wilson-Pham, Associate Graduate School Dean at Rush University, who urged institutions to adopt holistic admissions practices, rather than relying too heavily on specific metrics such as cut scores. “The absence of evidence isn’t the evidence of absence,” she said, referring to the data she collected over more than a decade that indicates such practices inherently introduce bias into the admissions process. Wilson-Pham went on to explain that by using data to justify the use of all admissions criteria, her team was actually able to incorporate objective measures of student performance – such as standardized tests – into their plans to increase diversity. Ultimately, she achieved a 46 percent increase in diversity of URMs. Furthermore, by using data to examine admissions processes at large vs. the strengths and weaknesses of each individual candidate, Wilson-Pham’s presentation also demonstrated that systemic deficiencies outweigh perceived deficiencies of individual students. As institutions look for diversity in their pools of graduate candidates, some are realizing that it’s not students who are underqualified or admissions processes that favor certain types of students, but larger systemic issues that both block access and drive URM students away before they complete their degrees. In other words, there is no single factor that decides whether a student enters or completes his or her graduate program. Instead, it is an intricate mix of personal and professional life and can be heavily dependent on the culture of the university itself. Enhancing diversity and inclusion is more than changing the numbers on an enrollment data sheet – it is about changing the culture of the university and instilling an attitude of understanding and supportiveness at the highest levels that is reinforced across the campus. Of course, as institutions look inward at their campus climates, we were also reminded of the importance of looking at the individual level. Bentley Gibson, founder of The Bias Adjuster and Associate Professor of Psychology at Georgia Highlands College, led the group through an implicit bias training to uncover and mitigate personal unconscious biases toward different groups. By bringing the focus onto individual psychologies, attendees were forced to consider the power of the associations made since childhood and how those associations play a role in our work on campuses across the county. Mitigating implicit and unconscious biases is possible, however, through such methods as thinking about counter-stereotypical situations and getting diverse individuals to work on the same team. The interconnected nature of these three themes reflects the complexity of graduate program diversity. There are actions that can – and should – be taken at both the individual and the institutional level in order to improve the numbers of URMs in graduate programs as well as help to retain and allow these students to prosper. It is a challenge that requires solutions as comprehensive and thoughtful as the issue itself. 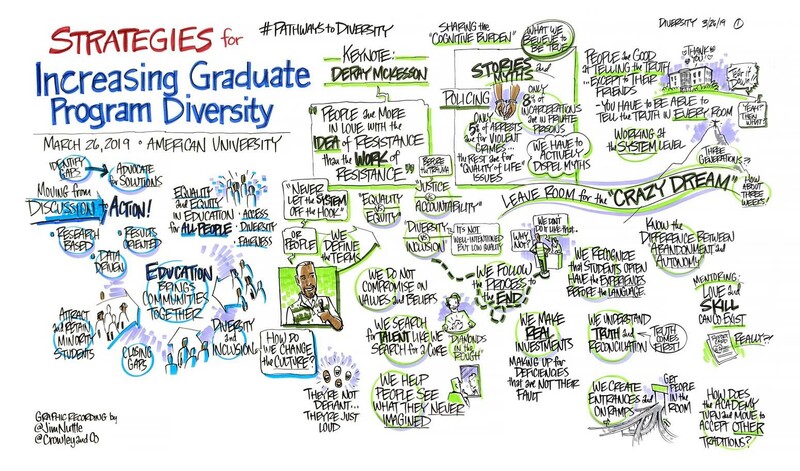 For more information and examples of the types of tactics discussed at the Strategies for Increasing Graduate Program Diversity event, please visit www.ets.org/diversitysymposium. Also, continue the conversation on Twitter using #pathwaystodiversity.